In which we stick our toe into the murky pond of off-brand Japanese light meters from the '60s. When CdS came out, the Japanese went into overtime, and a ton of inexpensive meters flooded the American market under all sorts of names. Many of them, if you put them side by side, are identical except for branding. Some are simply cosmetic variations of the same thing. 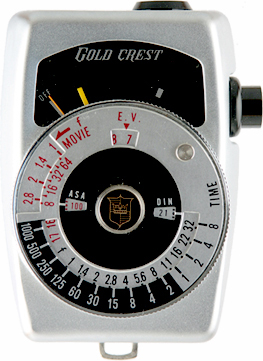 This Gold Crest appeared in 1966, and then later in the early 70s under the Lentar name (Lentar branded all sorts of accessories and such); they're the same meter. Even the instruction books are identical except for the cover art. There is nothing to identify the actual maker, but I suspect it's Showa-Koden, a Japanese company responsible for all sorts of meters under a variety of names. I also suspect (though the evidence is slim) that this is a continuation of the old General Electric meters. GE left the market in the early 60s when CdS changed the state of the art. My guess is that GE sold their meter operation (tooling, designs, you name it) to a Japanese company, and this is one of the results. I base it on the model name, PR-66, which continues GE's model numbering scheme (they used PR-n for years). It wouldn't surprise me at all to think that GE was working on a CdS meter when the unit was sold, and the Japanese took it over. Or maybe they started with a clean piece of paper, but kept it up anyway. I easily could be wrong, but I don't know why anyone would give a "PR-nn" designation for any other reason. Nice little meter. It's clean and easy to use, and reminds me a lot of Sekonic's L-98 Micro-Leader. I got mine still in the original box, gently used, with the case, a shoe-string cord, and the instructions.